These are the same "Insulating Cup Sleeves" you find in any Starbucks Coffee House. Now available via our fantastic partnership with Starbucks Coffee. These Sleeves fit over the Starbucks Cup, to protect a hand from the heat. 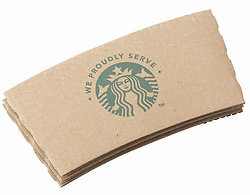 These sleeves are the perfect match with the Starbucks Logo Hot Cup - Paper 12 oz. Critical to completing the Starbucks Coffee Experience..